A wizard is never late, nor is he early. He arrives precisely when he means to. And this should logically stand very true for the Chronomancer, or time mage. To rewind a bit (time-puns ahoy! ), I found a new game – Frostgrave. 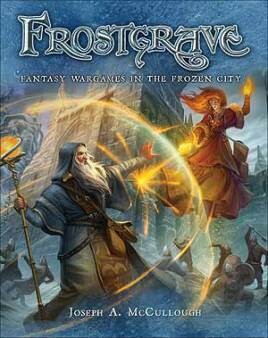 In short, Frostgrave is an old-school type and feel of a game where you play as a treasure seeking wizard with his/her apprentice and pseudo-trusted entourage. It’s played in a campaign-style way where you gather treasure, learn new spells and establish a base from which you operate. Very role play-y. Tickled me in all the right spots, in other words. There’s 10 different schools of magic (chronomancy, necromancy, elementalism, summoner, thaumaturgy, enchanter, sigilism, illusionism,soothsaying and witchcraft) each with 8 spells each. Since I’m a sucker for timey wimey stuff, I felt the need to get myself a chronomancer – just to be ready if I’d ever play the game! Attention span short and curiosity peaked I put all other projects on pause and made time and space for a wizard and his trusty apprentice. The rest of his crew would be made up of re-purposed Mordheim Witch hunters. 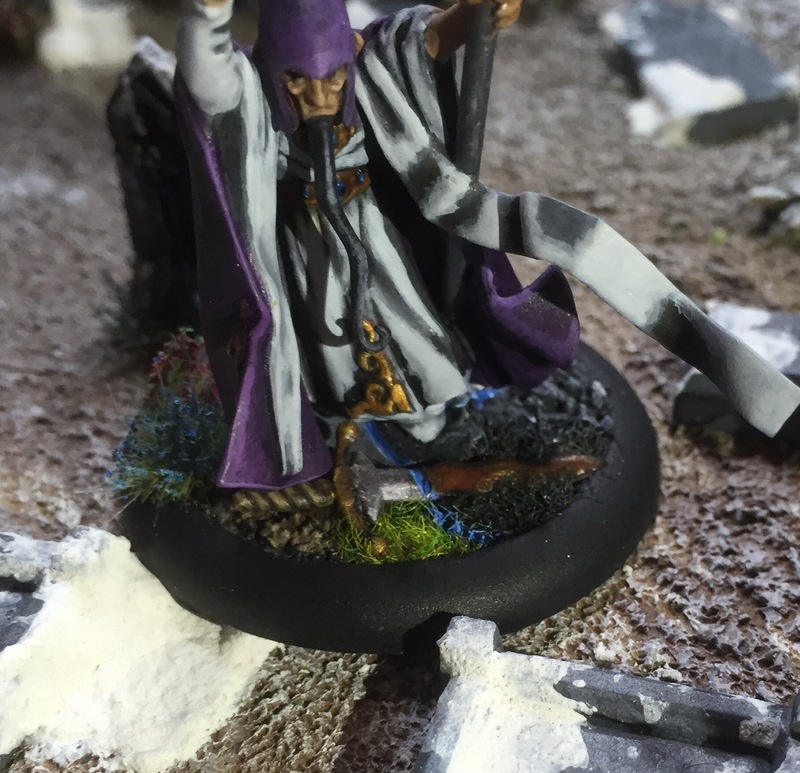 For the master Chronomancer I went with a Warhammer Fantasy Empire Battle Wizard, because it’s a really lovely modular plastic kit with lots of cool bits to use for a wizard. But honestly, it was the hourglass that did it mostly. I wanted to cram as much “Time magey” stuff into the model as possible, but hopefully it didn’t go too much overboard. Obviously he needed an hourglass, because Time. To emulate some sort of magic time manipulation I went with an inverted sort of sand, so the sand is actually dripping upwards from the bottom half. 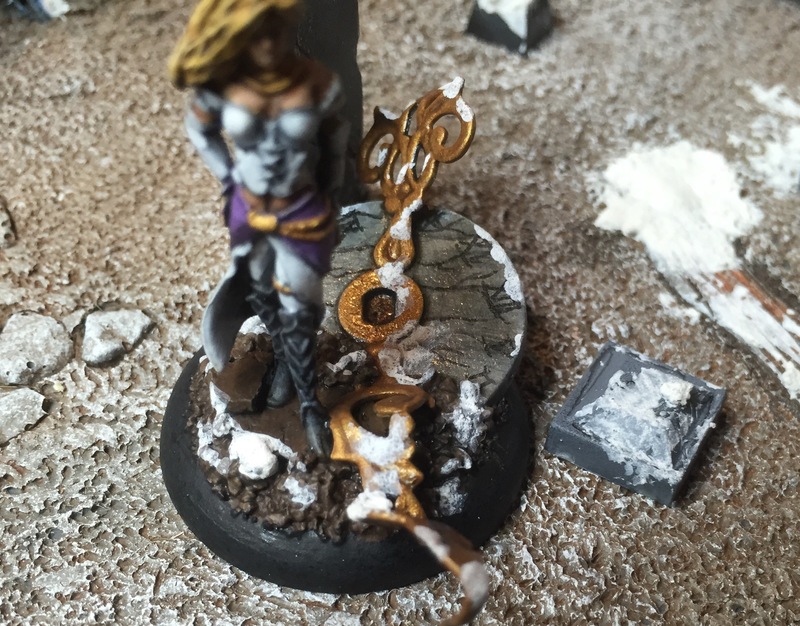 I also tried to make his base a bit more fit for a centerpiece model, so I tried to the best of my abilities to try and emulate some sort of “time whirl”, which is why there’s both winter, summer and beyond-time-death-stuff represented on the base, where I used the sword to try and tell the story of how it’s instantly rusted. Originally there was going to be a secondary model on the base, some sort of assaulting knight struck mid-time, but space just didn’t allow it, even though I went with a 40mm base instead of 30mm which I originally intended. I almost went with pure purple, but in the end I’m very happy having gone with white robes. Purple allover, as fancy as purple is, would still have been pretty boring, I’m afraid. Base close-up, minute picture. Get it? 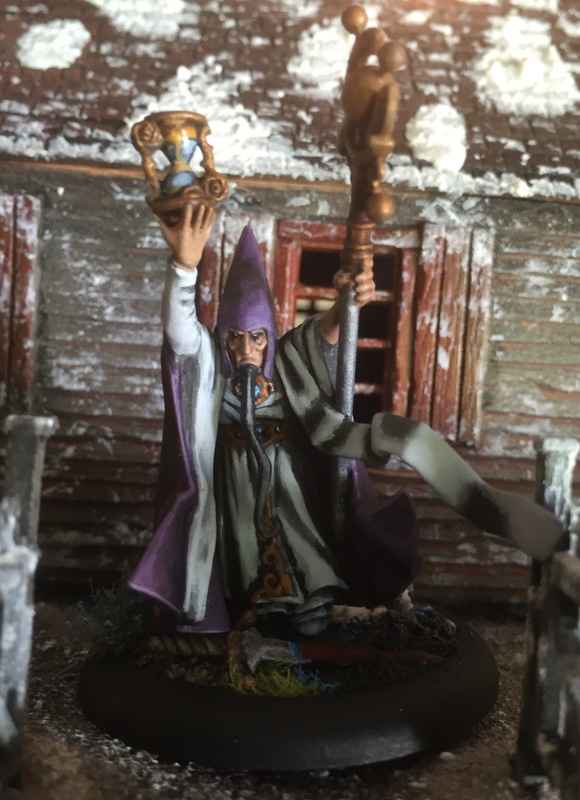 For an Apprentice I didn’t have any good idea for a long time, until I out of the blue won a contest on the Frostgrave Facebook page. Mountain of Metal hosted the contest, and I won three models which are bound to be released sometime this or next month. The fair rogue-lady looked sneaky enough, and the model is wonderful, so I gave her a pocket watch (Big wizard, big clock/hourglass. Rookie wizard, small clock. Makes sense, right?) made from green stuff and called it done. To make it a bit more timey wimey, I placed the remains of an old ruined clocktower or somesort and gave the dials a proper bend to tie in with the chronomancers view on time. Besides holding a pocket watch, she’s also holding a dagger behind her back, and I figured that while the Master does all fancy stuff, the apprentice makes due with just stopping time and stabbing opponents repeatedly – I mean, that’s what anyone with limited knowledge of time magic would do, right? Looking a bit too satisfied, aren’t we…? And finally, the dynamic duo assembled! 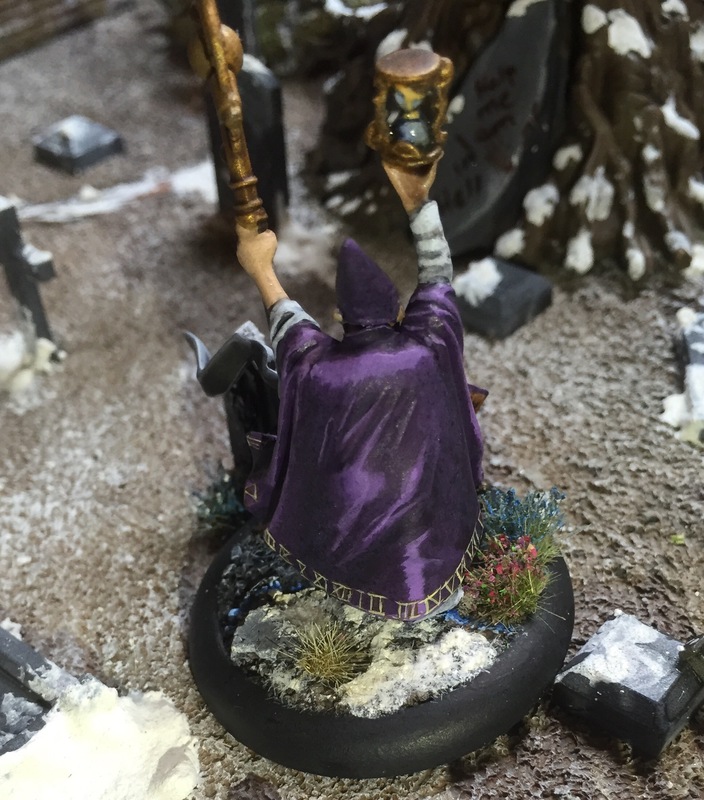 Best thing is that this pretty much sums up all I need to do to play a proper, all-painted game of Frostgrave. Well, besides finding the time in my overly crowded parental leave-schedule. Still need names, too. I’m thinking Corvax for the master, because of the educational animated series Muzzy in Gondoland, which involves eating clocks. Anyways, I should probably stop now.